Sometimes I wonder how anyone ever came to eat rhubarb in the first place. It looks much like celery, but the outside is green to pink to red. (When you cut it, the inside is still green.) You can’t eat the leaves, which are toxic. You have to stew the stalks until tender, as they can be stringy. And it is very sour. Well – maybe the last was considered a feature, not a bug. My father told me that, when he was a boy in Central New York, rhubarb was considered tonic – a good, healthy thing to eat after a long winter. And when you look around at traditional “tonics” they tend to be either sour or bitter… It must be Good For You! 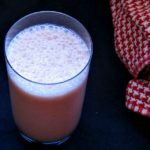 But in fact, rhubarb has a decent Vitamin C content, and may have been beneficial, when fresh vegetables had been scarce for a while. Traditionally in the US it was sweetened and served either as sauce or in a pie – in fact, it was often called Pie Plant. My grandmother made a Lemon Rhubarb pie – essentially lemon curd with rhubarb, and fantastic! Strawberries are a common addition, for good reason. Their sweet/sour comes down on the side of sweet, they boost the red color, and they’re available at the same time – or at least, that’s the theory… In fact, right now I find myself in an odd in-between phase – the supermarket no longer has Florida strawberries, the farmer’s market does not yet have even New Jersey berries (let alone New York!) I’ll probably be able to get both in a week or two, but I wanted to go ahead with writing this – and oh, look, there were still a few strawberries in the freezer that I want to finish up before local ones come in. 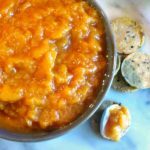 Local ones will be much better in this recipe – they’ll be sweeter, for one thing, because they’re fully ripe and these were not (though neither were the ones in the supermarket) – but I want to get this written in time for more of you to use it! So – what else would go well with it, and add a bit of sweetness? How about orange juice? It’s also a little tart, but mostly sweet, the color will pull to orange (but not mud) and – well, I had some on hand… always a point. First, trim, wash, and chop the rhubarb. When you buy it, there shouldn’t really be any leaves – if you get some, be sure to discard them. I got a scant 2 cups from my four stalks. Put them in a small heavy pot with a cup of orange juice, bring it to a boil, and keep it at a rolling simmer (low boil?) 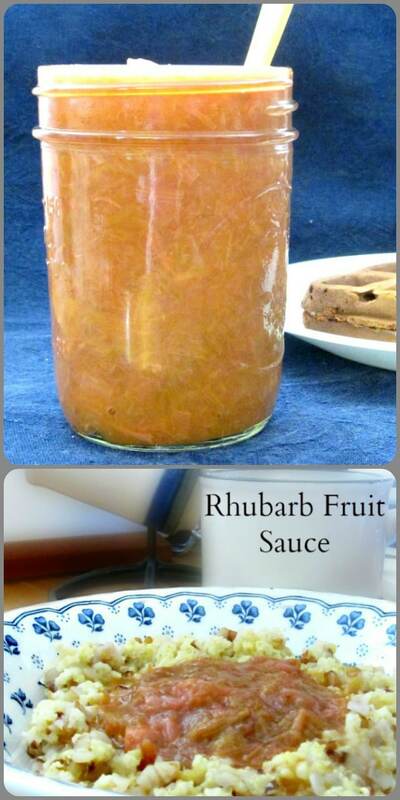 for 20 minutes, to reduce the orange juice as well as cook the rhubarb. Meanwhile, I pulled out the frozen strawberries, cut them in big chunks, and measured out a cup. After 20 minutes, I added them, and gave the sauce another 15 minutes. (If you have fresh berries, you may want to add them later, and cook them less.) Then let it cool a little before adding half a teaspoon of vanilla. I also use it as a condiment with savory dishes – it adds a lovely sparkle to pork and beans. The spring equivalent of cranberry sauce, really! 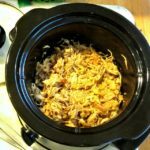 Drizzle a little over a plain chicken thigh… add a dollop to bean soup… pour some into the slow cooker or pressure cooker with your pot roast… The vanilla is not obvious, and didn’t bother me at all in this use – but you could skip it, if you want. I do think it rounds the flavors out, though. 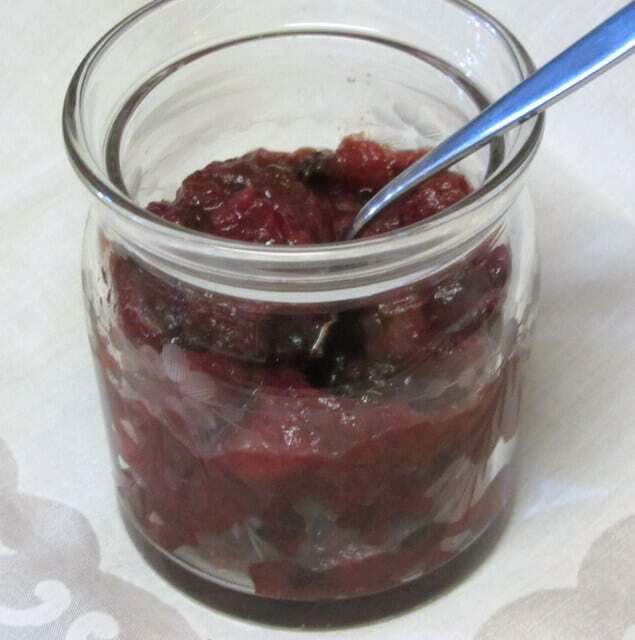 Rhubarb Fruit Sauce is a sour/sweet, brightly flavored condiment. Use with either sweet or savory foods, to add sparkle and interest. Trim, wash, and chop rhubarb. 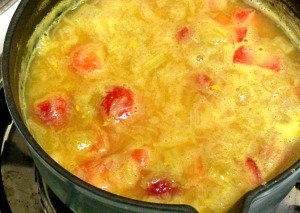 Place rhubarb and juice in a small heavy pan. 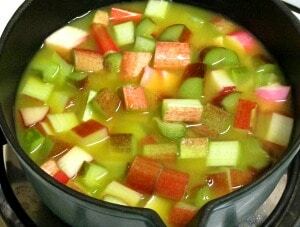 Bring to a boil, and keep at a rolling simmer for 20 minutes, to reduce the juice as well as cook the rhubarb. Add strawberries, continue cooking another 15 minutes. Let cool 15 minutes (or longer) then stir in vanilla. Chill, and let flavors meld, before using. 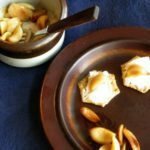 Use the sour/sweet sauce over waffles or hot cereal, with ice cream or other sweets, or with bland savory dishes that could use a punch of flavor. Such a pitty we don't have rhubarb in Greece! I would love to try this sweet sauce! Oh, I'm sorry! You have so many lovely fresh vegetables and fruits, though... A friend was there last summer, visiting his wife's extended family (so not in hotels) and came back raving about the produce! 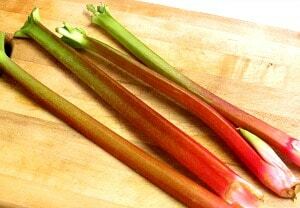 I love rhubarb but have never tried cooking it because I knew there was something you had to do to it besides chopping.. But wasn't sure what to do with it! This sounds yummy! Thanks! Really, just cook it... Well, and discard leaves, in the unlikely event you get any. 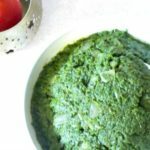 It is quite sour, too, so use it so that is a feature - balanced either with something sweet, or in a savory dish where a little sour will add interest. If you try this, enjoy it! Anne, my mum just gifted me a bunch of rhubarb and this is perfect! I love fruit and savoury pairings, rhubarb is so adaptable, and I cannot get enough of it in the the season. Although I usually just stew it with a little orange as a cereal topper. 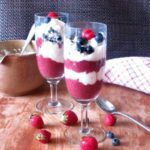 I'm doing more and more fruit - especially sour fruit (this, pie cherries, cranberries, let's not forget lemon and lime...) - in savory recipes. A whole world of flavor combinations I'd never used! And I've used most of this on my cereal... Glad to hear from someone else doing this! Rhubarb is wonderful and I love it when it comes into season. It's lovely paired with orange too. Oddly, I'd never cooked it with orange before. Believe me, I will do it again... I really liked that combination. Love all this natural sweetness! I love rhubarb and love with the season comes! 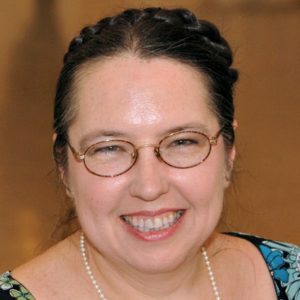 I don't use any added sweeteners, and I'm careful even with very sweet fruit - that's just been best for my body. (And luckily Rich is willing to go along... LOL) But rhubarb needs something to balance it - whether it's chickpeas, or pork, or something sweet. Since I'd already written savory... Even to my taste, this is still a little more sour than sweet - but I'm not the only one who likes the sour flavor! You know for some reason I just don't do a lot with rhubarb. I love strawberry rhubarb pie. I agree with you, I really don't know why people started eating it. I do remember as a child I would pick it out of my baba's garden and eat it raw dipped in LOTS of sugar. Those were the days!! I didn't do much for years... Well, for years, it was hard for me to get, so that's probably why. Oh! I didn't know anyone who'd eaten it raw! But fresh out of the garden - I've eaten raw peas and corn I'd just picked, so... What a lovely memory! Thanks for sharing! 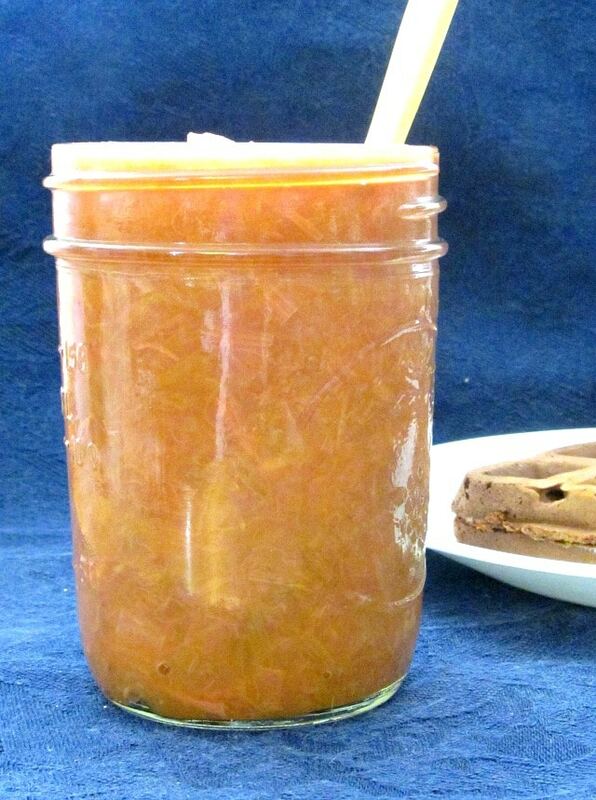 I think it's amazing that you made a rhubarb sauce with no need for tons of sugar. Fantastic. Thank you! So many rhubarb recipes are so sweet - and while I do think I need something to balance the sour, I didn't feel the need to totally drown it out! Very interesting. 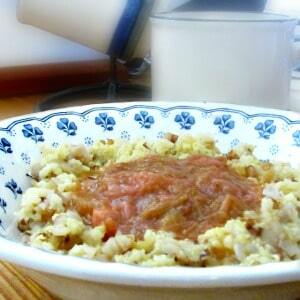 Never would have thought to make a sauce with Rhubarb -- but if it has tonic effects -- why not? I do like rhubarb pie (though I've only had it once). It reminded me of lemon pie. Well - I won't swear to the tonic effects... LOL But after a winter of cold storage and canned vegetables, it must have felt so refreshing! Right - we forget how bright the sour taste is, and that we use sour lemons and limes all the time to get it. I love having an option. 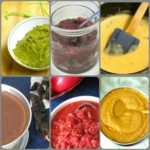 I love rhubarb, this sauces sounds wonderful and I can imagine it's many uses, with chicken, as you suggested, in particular! Thank you! I've actually added it to a couple of recipes this week, just to add some sparkle. It's even more versatile than I'd thought! Perfect! Enjoy it! I love being able to use such fresh ingredients. 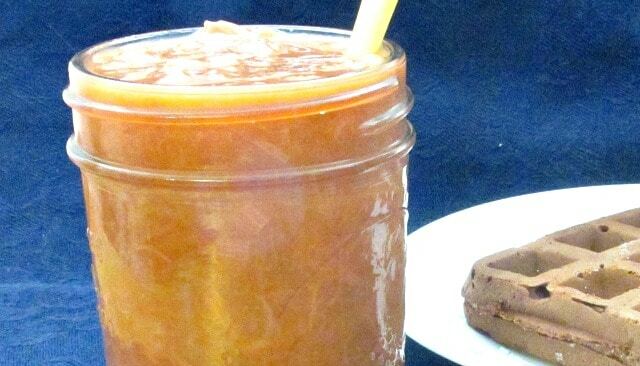 My mother always cooked rhubarb and apples together for a flavored applesauce. It was really good. I like that your recipe has strawberries in it. I agree, this would be great with pork. This looks great and I love that there's no sugar in it! Thank you! I know that most people don't need to actively avoid added sugar the way I do. But it creeps into so many things - I know that many are looking to decrease the number of sweetened foods they eat. 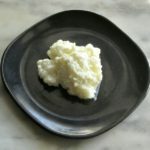 And I think this also makes it more versatile, since it can be used with either sweet or savory dishes. I LOVE rhubarb!!! I used to be able to come across it fairly easily in the summers before moving to California. Now I'm lucky if I see it twice in a season. But my husband came home with a generous amount of it last week and I'm looking for ways to use it up. 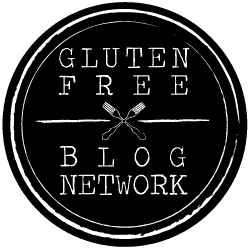 Thanks so much for sharing this at Healthy Vegan Fridays - I'm pinning & sharing =) I would love to see more of your recipes shared! Oh, perfect! Enjoy it! 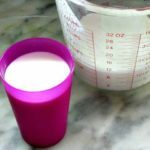 A glance around will tell you that this is not a vegan blog - though certainly many of my recipes are - so I'll be in and out sporadically, as I have something appropriate. What is the nutritional values for this sauce? I'm not sure... I tend to pay attention to what I eat, more than the numbers. And of course, whenever you're working with any kind of fruit or vegetable, actual numbers will vary a bit anyway... You can plug it into the program at Fitday or Sparkpeople, and that will give you something to work with, if you need numbers.